Browne celebrates the 2016 semi-final win over Glasgow. GALWAY NATIVE ANDREW Browne will, “with great sadness”, bid farewell to his native province after a 13-year association and 156 competitive appearances. The 31-year-old lock made his senior debut in 2007, reaching a pinnacle when he played a part in the 2016 Pro12 final in Murrayfield when Connacht ran out 20-10 victors over Leinster. “What a journey!! It’s with great sadness that I say goodbye to Connacht rugby after 13 years,” Browne wrote on an Instagram post this afternoon before Connacht later confirmed his exit. “It’s been amazing to watch this club grow… and I feel very privileged to have played a small part along the way. Unfortunately, injuries have hindered me the past couple of years and I haven’t been able to contribute to the team as I would have liked. But, as we all know, injuries are a part of rugby and you learn to take the good with the bad. Achilles and shoulder injuries have restricted Browne, younger brother of ex-Leinster lock (now an endurance adventurer) Damian, to just a single appearance this season and he included special mention for the strength and conditioning staff at the Sportsground along with supporters and players he has shared the pitch with. Browne will be the fourth member of the title-winning team to depart Connacht this summer, joining captain John Muldoon, Jake Heenan and JP Cooney. “Andrew Browne has been a great player and leader for Connacht on the field and a fantastic ambassador off it over the past 11 years,” CEO Willie Ruane said in today’s evening’s statement. “He is an incredibly resilient character and represents everything that is good about Connacht Rugby and what we aim to achieve. 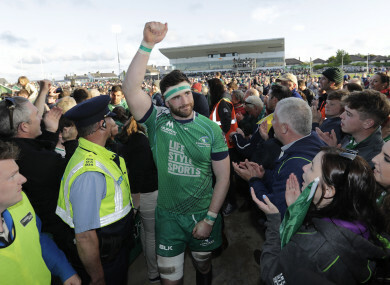 Email “Another title-winner departs Connacht as homegrown stalwart Browne bids farewell”. Feedback on “Another title-winner departs Connacht as homegrown stalwart Browne bids farewell”.